Long a force to be reckoned with in the design world, Italian architect Piero Lissoni has now turned his attention to The Ritz-Carlton Residences, Miami Beach. 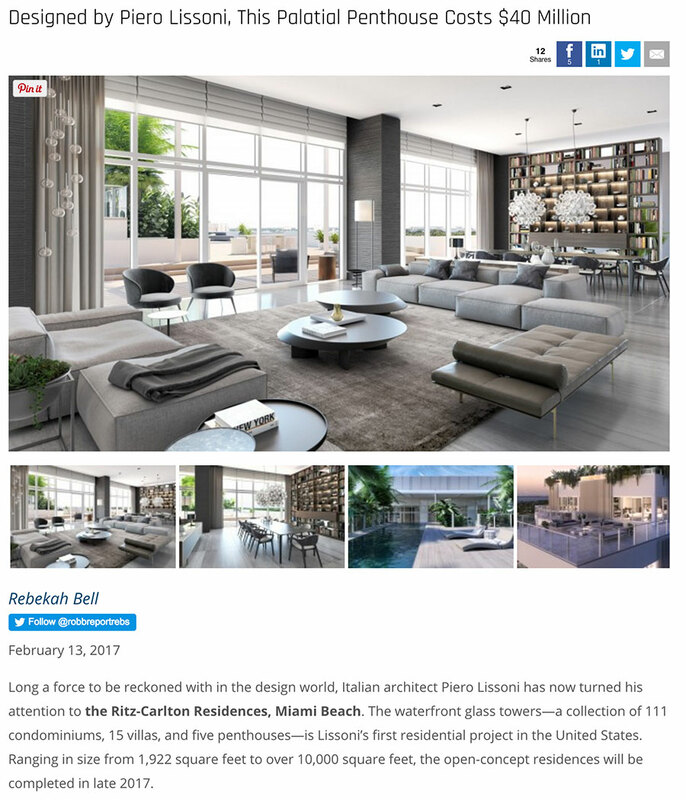 The waterfront glass towers—a collection of 111 condominiums, 15 villas, and five Miami penthouses—is Lissoni’s first residential project in the United States. Ranging in size from 1,922 square feet to over 10,000 square feet, the open-concept residences will be completed in late 2017. 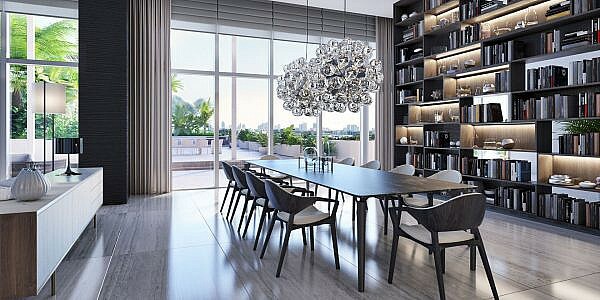 New renderings for the penthouses in Miami have been released, below. Though each dwelling is extraordinary, the crème de la crème is the rooftop penthouse suite, a modern marvel which boasts over 12,000 square feet of interior space and 13,000 square feet of exterior space. Currently on the market for $40 million, the eight-bedroom, 10-bathroom layout combines tall ceilings, expansive glass windows, stone and wood floors, and contemporary light fixtures to create a modern, tropical oasis. Private elevator foyers funnel into the sunlight-drenched interiors, where waterfront views abound from every angle. The living and dining areas blend together seamlessly, showcasing muted, earthy tones, wood floors, and built-in, floor-to-ceiling bookshelves. Double doors lead into two separate master suites with giant wardrobes and direct access to rooftop pools. The gourmet kitchen is outfitted with stone countertops and an arsenal of Gaggenau appliances including a built-in refrigerator and freezer, stainless steel wall oven, dishwasher, coffee machine, and microwave. Oversized, glass-enclosed rain showers, stone floors, and deep soaking tubs add a spa-like element to the bathrooms. A private Hammam spa brings the service of a five-star resort to the comfort and privacy of one’s own home. 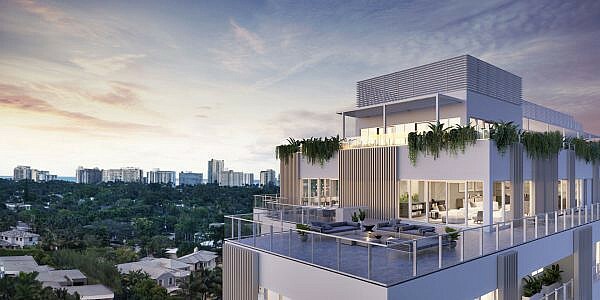 A library, his-and-her studies, wine tasting room, family game area, and screening room make the miami penthouses for sale even more alluring. Offering a bird’s-eye view of the ocean, the sumptuous penthouses in Miami are the perfect place to unwind after a busy day.